Here is a section with most frequently asked questions to both our sales as support team. Did not find the answers you were looking for? Start a chat or whatsapp conversation with Funtear in the right below corner. Polished, SSL or untreated aluminium? What is the difference between the different types of aluminum we can choose for our Funtear is a frequently asked question. Here is the explanation. First of all. Aircraft style trailers are initially not intended to have a mirror shine. It ia a consequence of removing corroded spots on aluminium. Corrosion occurs when untreated aluminium is exposed to oxygen. Typically Vintage trailers were protected by wax or clear coat. Once that is gone corrosion starts! Clear coat has a 20 year life span… So that explains why Vintage trailer often are mirror shine polished. So the first sort of aluminium we use is untreated aluminium. This aluminium will age rather quickly and have a matt elephant skin like finish. Corrosion on aluminium will not ‘eat’ away the material. It is just a sort of powder finish. So for a real Vintage look and feel…. untreated aluminium. And it is the cheapest sort we can use. Secondly we offer the prepolished aluminium skin. The sheets will mechanically be polished to a high mirror shine look. Your trailer will look stunning. You can wax your polished skin to keep it in good condition. In due time you need to re-polish your trailer. We advice to keep it up-to-date every other year. Maintenance of polished surfaces takes some tools and will be 30 minutes per square meter. The most sold however is bright SSL. This is u brushed and anodized Stainless Steel Look. Anodized aluminium is protected from getting corroded. This is a maintenance free material. Just water en soap will do. On top of this we can apply an extra layer of clear coat to prevent surface scratching. Do you have a list of all models? Available with optional trolley top roof and as a FunFloat build on a pontoon. Cedar Woody can also be made in Funtear Cabin Lodge specs only with a trolley top roof. And of course we can build every custom size you want that is not listed here…. Caravans for people who don’t like caravans? Over the years this became our most famous quote. It wraps it all up! Generally speaking our product is much appreciated. Our customers love the craftsmanship that makes a Funtear. 100% handbuild and in the aluminium bodies more than 300 hours of labor are put in any of them. Funtears are build for life. The classic design of the Funtear attracts a lot of people. Even the ones who traditionally dislike the white box brand trailers. We hear it all the time. Funtear represent freedom and a way of life in the great outdoors. Funtears are generally seen as a ‘home away from home’ and not just for a 3 week holiday. Commercially the iconic 1950’s design makes it stand out in the crowd. 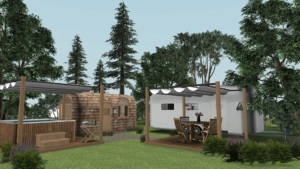 Funtear Structures is manufacturer of retro 1950’s design aircraft style structures like trailers, caravans, tiny houses, lodges, waterhouses, foodtrucks, teardrops, motorhomes and 5th wheels. Funtear is located in The Netherlands and ships worldwide. Funtear has 3 main types of shell bodies: riveted aluminium (classic), red cedar wood shingles and fiberglass. Funtear started in 2006 with developing our own teardrop trailer. That’s also the origin of the name Funtear. The idea behind our Funtear Teardrop was to build a trailer in the same way as the aircraft style riveted ones. In our design we focussed on the radius shapes. Our door needed to be special as wel. We have a fetish for doors 🙂 . No, certainly not. Airstream Inc. is a fellow manufacturer who also builds aircraft style aluminium caravans. Technically, there are more differences than similarities. Airstream is probably the best-known builder of the aluminium riveted type of products and is often identified with the type itself. Airstream only produces travel trailers/campervans and is part of the largest RV manufacturer in the world: Thor Industries. In 2017 Airstream also required Nest and entered the glasfiber markets with Airstream Nest products. FunTear Structures originated from a restoration company of old American aluminum caravans (Tin Cans) and has gained extensive knowledge of the building process. FunTear has transformed that knowledge into an own product. Funtears are a European product and therefore build to European standards from scratch. Other renewed companies who still manufacture aircraft style trailers are Bowlus Road Chief, Silver Bullet and Silverstreak. Back in the 1950’s there were numerous companies active. Aircraft style trailers are mainly handbuild which makes them a totally different league compared to standard production trailers. Funtear builds in 3 shell types and all sort of categories. All Funtears are purpose-build to customer demands. Funtears are full monocoque constructions.We start we an empty base vehicle. SSL means: Stainless Steel Look. It is referred to as the brushed anodized aluminium we use for our classic riveted Funtear Retro. The SSL aluminium is one of your choices when you order a Funtear Retro. Other choices are plain unprocessed aluminium, mirror shine polished aluminium and spray painted or wrapped colored aluminium. What are the different Funtear chassis? When it comes to the starting position of every trailer we start with a chassis. To begin with: every chassis we use on a towable trailer is galvanized (opposed to the steel chassis used in he USA). For our Funtear Structures we use several chassis platforms depending on your model choice. For Funtear Retro and Funtear 5th wheel we use a handbuild solid welded chassis. For a riveted structure it is important to use solid welded chassis instead of a standard bolted on production chassis (like the BPW and AL-KO). For the Funtear Cabins and Lodge we use standard welded mobile home chassis. Using standard chassis keeps the pricing down. For the Funtear Cedar Woody we use an impregnated Douglas wooden frame as this most frequently is a static unit. Of course we can add wheels to the structure if legislation requires such. For the Funtear Fiber platform we use a bolted on AL-KO 13″ production chassis. The used AL-KO platform does not have wheel arches inside the vehicle. Funtear Structures are build to EU specs. We comply to all EU standards in any EU country. Every Funtear comes with an Individual Type Approval (E4). Every European country has to accept this approval and issue a license. When you collect your Funtear you can apply for a local license by offering your vehicle for inspection. The authorities need to check if the vehicle you are licensing is the same as stated on our documents. That makes sense! What is somewhat confusing for some is the Individual Type Approval procedure. Funtears are not mass produced like most big manufacturers. That’s why an Individual Type Approval is issued by Dutch RDW after inspection. There is no such thing as a COC for individually build units. Funtears are licensed all over Europe. We have them in The Netherlands, Belgium, UK, Germany, Luxemburg, France, Italy, Portugal, Norway, Switzerland and Denmark. In most countries it a small procedure to get your local license. The only country so far we know that takes a long time is Belgium. We do not know why. Just a fact. Yes. 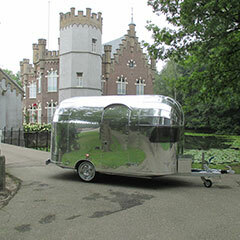 An Airstream is build in The Netherlands with foremost European components. So we comply with the EUR1. If you need a EUR1 document with your purchase we need to know that in advance. It takes a couple of weeks for the authorities to issue one. What is a Funtear Cabin & Lodge ? In 2017 Funtear started to actually bring one of the ideas of the Funtear Lab to life. The iconic aircraft style design would make a great rental unit on a leisure park. But for most parks the regular Funtear Retro units are too small to fit the number of guests they require. The second idea behind the Funtear Cabin & Lodge was to keep the price as low as possible. A lot of features on a Funtear Retro towable are simply not used on a Lodge in a leisure park. Secondly the interior of a leisure unit need to be of a somewhat different nature. Normal toilets, normal bathrooms and normal kitchens are required! Voilá: The Funtear Cabin & Lodge. Funtear Cabins & Lodge can also be build on a pontoon for use in marinas. We call those our FunFloats. Pricing starts at € 54.500 ex VAT EXW. What is Tin Can Town? Tin Can Town is the name of a leisure park concept. With the rise of the platform economy it becomes fashionable to rent out our great iconic trailers as an AirBNB location, guesthouse or on leisure parks. Retro Resorts are a great boutique hotel. So that’s why we thought of our own platform. Tin Can Town is any combination of Funtear Structures. You can create great experiences with Funtear Cabins & Lodges, Funtear Retros and Funtear Cedar Woodys. Just imagine a nice Funtear Retro to sleep in, a nice Funtear Woody with your luxury bathroom and sauna and a great patio with a hot tub. A Big Green Egg to cook your favorite meals. That is the WOW factor! Does shell size include the A-frame and hitch? No. The stated shell sizes do not include the A-frame, bumper sections and hitch. Generally add 1.25m for that. What are Funtear Fiber sizes? Sizes exclude the a-frame and coupler. What are Funtear Woody Sizes? Funtear Woody is basically a static unit. We can add wheels for compliancy with local rules. What are Funtear Cabin & Lodge Sizes? We basically can build any custom size for your Cabin & Lodge. Our base units are 3.65m wide. As an extra feature you can order a trolley top roof. What is the price of a Funtear? By far the most frequently asked question. But also the most difficult one to answer. That’s why we saved it for last. In general we believe that every price has a source. Cheaper products are build or sold cheaper. So making a price comparison only makes sense when you take everything into consideration. And that is where marketing comes in. What do you really know about the product you are willing to buy? Funtear manufactures purpose-build trailers. We are a small production company where most components are handbuild in small series. So every comparison with standard production units do not make sense. We our proud of our product. We make it a different product than anybody else. We have our own chassis, our own windows, our own doors, our own floors and our own flanged segments. We have our own design and we do exactly what YOU want us to build. We can make endless variations. What is important to you? Heavy duty vehicles need a heavy duty chassis! We do not cut on a budget there when safety is at stake! And so we can talk for hours about the choices we make. The price of your Funtear depends on a lot of different choices you have to make. The most visible choice is the choice for a shell type. The classic aluminium shell or the cedar wood or the glass fiber? The production time of the aluminium shell is the longest as opposed to the glass fiber which takes the least time. So the aluminium shells takes the most out of your budget as where the fiber takes the least with the red cedar in the middle.